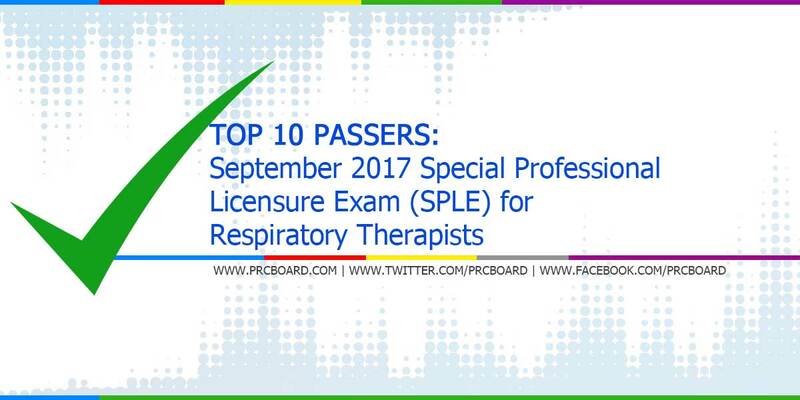 The 'September 2017 Special Professional Licensure Exam (SPLE) for Respiratory Therapists results', conducted by PRC’s Board of Respiratory Therapy are released few working weeks after the last day of board examination. Aside from the official list of passers, top 10 examinees, top performing schools and performance of schools are also posted. Below is the complete list of SPLE-Respiratory Therapist top examinees, courtesy of PRC. While most examinees are asking about the possible release date, as quoted from the main page of this article, it will be out after few working weeks. Meanwhile, the duration mentioned is just target/ estimated timeline, results may be released earlier or later without prior notice.